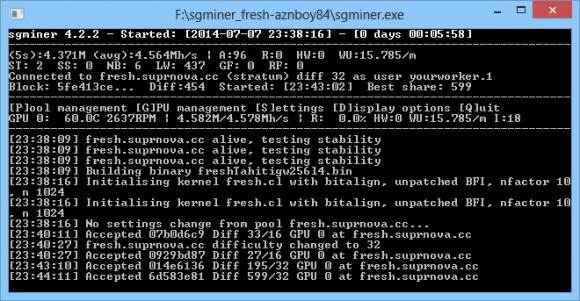 It did not take much time before we get the first sgminer fork with improved performance for the new just launched today Fresh algorithm, the fork is by aznboy84 who managed to squeeze some extra performance (source). We have compiled a windows binary from the source and you can download it below and try to see what extra performance you will get on your mining hardware. Our tests on an AMD Radeon R9 280X shows an increase of the hashrate from about 3700 KHS with the official Fresh miner to about 4600 KHS with the new improved fork, so definetly a good idea to update for some extra hashrate.